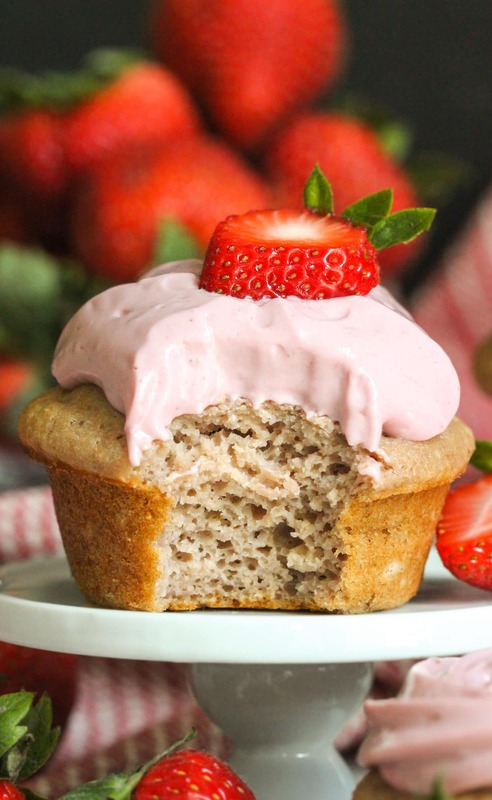 These Strawberry Cupcakes are sweet, springy, fluffy, and bursting with fresh strawberry flavor! Taste tested by friends and family, and enjoyed by ALL. 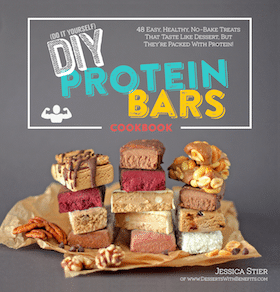 No one knew these were refined sugar free, low fat, high protein, and whole grain too! The grocery store’s baking aisle never ceases to amaze me. I am mesmerized pretty much every single time I walk through it. Every location carries different products and different brands at different prices and different sizes… but there are some things that never change: boxed baking mixes. I don’t know why but I love to stare at them. For a good five minutes, probably. I guess I like the variety? From chocolate to vanilla to red velvet to even BLUE velvet. One particular box always grabs my attention: the strawberry cake mix. The cake pictured on the outside of the box is so vibrantly pink and delicious looking, it’s hard not to stare. You can almost taste it just by looking at it. One day, I stopped staring and finally picked up the box to look it over. I glanced at the nutrition label and read (or, attempted to read) the ingredient list. My eyes opened wide in shock, I gently placed the box back on the shelf, and walked away in awe. How could so many bad things come in such a pretty package?? On my drive home, I was determined to make a healthier, all natural, homemade version. Pink cupcakes for October? PERFECT. Almost all of the recipes I’ve seen for Strawberry Cupcakes call for artificial red food coloring and sugary jello mix… no thanks. I was all on my own to handcraft a recipe. Aaaaand as embarrassing as it is, I gotta tell you the truth — these cupcakes were a long time coming! It took me four completely failed batches to get these cupcakes to be a success. Every failed experiment, the cupcakes were incredibly dense, chewy, and rubbery. Just terrible. The first two batches weren’t sweet at all, the third wasn’t pink (it was actually kind of grey? ), and the fourth was “okay,” but not something I was proud of. When the kitchen timer would go off — Riiiiing. Riiiiing. Riiiiing. — my heart would jump into my throat. How would these turn out? Should I give up baking for life??? 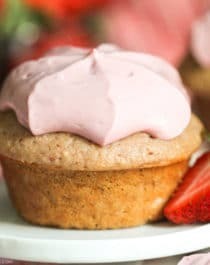 These Strawberry Cupcakes are sweet, springy, fluffy, and bursting with fresh strawberry flavor. 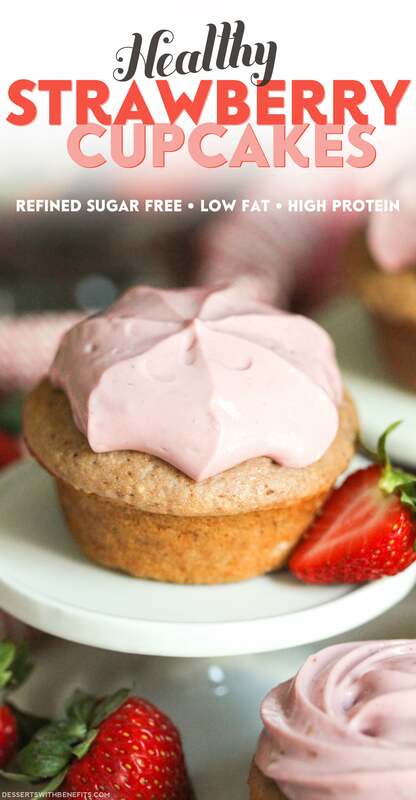 No one knew these were refined sugar free, low fat, high protein, and whole grain too! Preheat your oven to 350 degrees Fahrenheit and spray cupcake tins with cooking spray. In a small bowl, whisk together the whole wheat pastry flour, erythritol, starch, protein powder, baking powder and salt. **For the strawberries- rinse the berries, slice the greens off, and puree in a blender until completely smooth. 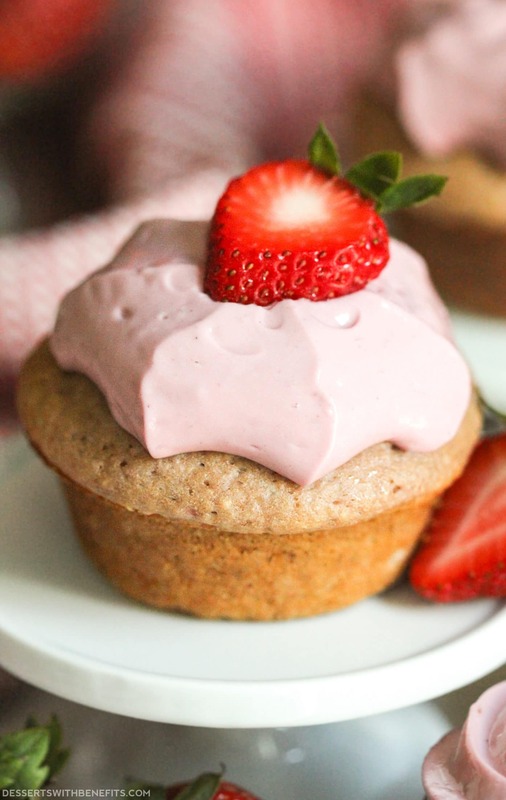 In a stand mixer bowl with beater attachment, add the strawberry puree, yogurt, eggs, stevia extract, vanilla extract, and strawberry flavor. Mix on low speed until completely mixed. Turn off the stand mixer and dump in the dry ingredients. Mix on low speed, then increase the speed to medium. Mix until JUST incorporated, you don't want to overmix this! Add the vinegar and quickly fold in with a spoon or spatula. Scoop the batter into the prepared cupcake tins and bake for ~25 minutes, or until the cupcakes spring back when tapped. Let cool in the pan for 5 minutes, then transfer to a wire cooling rack to cool completely. 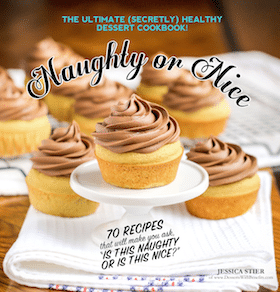 If you want a gluten-free recipe, check out the Strawberry Cake recipe in my Naughty Or Nice Cookbook. Simply scoop the batter in cupcakes tins rather than cake pans and bake for ~25 minutes. The frosting I used for the cupcakes is also from the cookbook! Yeah, I’ll take it. I’ll take seven, actually. This is totally a suitable breakfast option (I mean, I ate these for brekky). Whole grains, fruit, yogurt, eggs… this beats a big bowl of sugary cereal by far. Join me, will ya? Eat cupcakes for breakfast! Wow. Cakes likes these (I’m thinking carrot cake, since that is what it looks like) are usually calorie bombs, but this… I’m speechless. Sinless. I reaaaaally want to try this, I’m sure all my friends would love it! Looks so yummy…best time of year for anything strawberry! Do you have a vegan sub for the whey protein concentrate? I’m pretty sure casein or egg white protein powders can replace the whey, but not vegan protein powders. Just note that whey has a sweet taste, so you may need to adjust the sweetness level (most easily done with stevia extract). What can I use in place of the tofu ( I don’t eat soy)? I hope these work for you! What an awesome initiative KitchenAid USA is doing! I’m glad they’re supporting Breast Cancer Awareness. And I’m glad YOU made these cute little cupcakes. My dad’s favorite cake was always strawberry. Every year when I wanted to bake him a cake growing up – he’d request strawberry. It’s one of my favorites as well but I couldn’t tell you the last time I had it. I’d love to give these a try! Awww! Thank you so much for sharing that story with me 🙂 Glad to hear strawberry cake was loved in your house! Thank You for this delicious recipe. I replaced Double Acting Baking powder with aluminum free baking powder along with 1/4 cup olive and 1/3 cup (110g) strawberry jam to it and it was a lip smacking one. I have tried your CINNAMON ROLL OVERNIGHT DESSERT OATS, and it was too good. I make it often, as my son Ryan loves it. 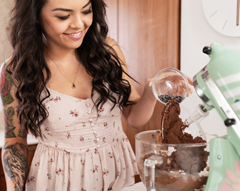 If the cookbook isn’t for you, I still have a ton of frosting recipes on the blog! After reading your post I could not stop to myself from making it. So i prepared it. It was too yummy!!! !